Today I found out how a car’s rear-view mirror works. Ever wonder what is happening when you flip a rear-view mirror up or down to increase or decrease the amount of glare coming from the vehicle behind you? I assume if you’re still reading, you have, or at least have nothing better to do at the moment than find out! In order to accomplish this dimming, less expensive versions of rear-view mirrors have what’s known as a “prismatic wedge shape” to the reflective surface. In more expensive models, electrochromism is used to automatically tint the mirrors surface when it is exposed to increasing light. Prismatic rear-view mirrors are manually operated using a tab below the mirror. This allows you to change the reflective surface angle of the light being reflected off it, “day” and “night” mode, if you will. What’s specifically going on here is the internal mirror actually is ground into something of a wedge shape, when viewed from the side, with the thicker edge at the top and getting thinner as it goes down. Thus, the rear surface reflects the light coming from a slightly higher object behind you then the front surface. In order to make the rear surface more reflective, like most mirrors, it is coated with a highly reflective material. Both the front and rear surfaces actually are reflecting light back at you, regardless of the position. However, when in the “day” position, the highly reflective back surface of the glass more or less overpowers the weak reflection you get from the front glass surface, both because it’s much more reflective and because it’s reflecting light from out the back of your car, which is often very bright, relative to the inside of the car. The front surface at this point is just weakly reflecting the light from the back seat of your car. At night, when you flip the mirror up, the back, highly reflective mirror is reflecting the light off the ceiling of your car, which means it’s reflecting almost no light because the ceiling of your car is typically almost black at this point, which is key for this system to work. The front glass, on the other hand, at this point is reflecting the bright car lights behind you, so you don’t typically notice the rear surface’s reflections of your ceiling. You just see the dim reflections off the front glass. Another method for dimming the rear-view mirror is electrochromism, which allows for automatically adjusting the amount of light reflected by the rear-view mirror. This is particularly handy in side view mirrors, which don’t typically have another convenient way to dim bright lights behind you. Electrochromism is a phenomenon that allows materials to change color when different energy levels are applied to them. Modern versions of these systems have photo-detectors mounted on them that sense the amount of light reaching the mirror. When the detectors sense the amount of light reaching the mirror is increasing beyond acceptable levels, an electrical charge is applied to the electrochromatic glass and the light transmission properties of the glass are changed. 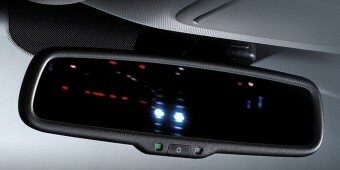 In effect, this tints the glass allowing less light to be reflected to the driver. Today, the main chemical used in this process is usually Tungsten Trioxide. Whether a base model Kia Rio that has a manually adjustable version, or a super fancy Jaguar that rubs your feet and talks dirty to you while adjusting the annoying light in your eyes, auto makers are assuring that the glare coming from the police cars lights behind you will not cause you any more distress than absolutely necessary thanks to these two rear-view mirror dimming mechanisms! The book “The Woman and the Car, A Chatty Little Handbook for All Women Who Motor or Who Want to Motor” (presumably very chatty, given the title), by Dorothy Levitt, written in 1906, recommended that women carry a hand-mirror while driving as it is convenient to be able to see behind you during traffic by holding the hand mirror up. This is the first known mention of rear view mirrors being used in automobiles. The mounted rear view mirror wasn’t available standard in cars until 1914. Ray Harroun is credited with being the first person to use a mounted rear-view mirror in an automobile, which he installed himself. On May 30th, 1911 while racing in the Indianapolis 500, Ray was unable to get a mechanic to ride with him during the race. This was the custom at the time, as it provided the driver with the ability to know what was happening behind him and to be made aware of any cars about to overtake him. Ray ingeniously installed a mirror on his car instead. While he is accepted as the person who first used this idea of a mirror on a car, Ray himself stated he got the idea from seeing a mirror used for the same purpose on a horse-drawn vehicle in 1904. Some of the most precisely shaped and smooth mirrors created by man are on the Hubble Space Telescope. Their surfaces do not deviate from a perfect curve by more than 1/800,000ths of an inch. To put that in perspective, if Hubble’s primary mirror were scaled up to the diameter of the Earth, the biggest bump would be only six inches tall. Hubble’s mirrors are made of ultra-low expansion glass and kept at a nearly constant room temperature (about 70 degrees Fahrenheit) to avoid warping. The reflecting surfaces are coated with a 3/1,000,000th-inch layer of pure aluminum and protected by a 1/1,000,000th-inch layer of magnesium fluoride. The magnesium fluoride makes the mirrors more reflective of ultraviolet light. The modern mirror is made by silvering or spraying a thin layer of silver or aluminum onto the back of a sheet of glass. Featured in English folklore, should you chant the name “Bloody Mary” three times while looking in a mirror, the ghost of Bloody Mary will appear. Bloody Mary is often believed to be the spirit of a young mother whose baby was stolen from her, making her mad with grief, eventually causing her to commit suicide. It is said that if Bloody Mary is summoned, she will proceed to kill the summoner in an extremely violent way, such as ripping their face off, scratching their eyes out, cutting their head off, driving them insane, bringing them into the mirror with her, or scratching their neck, causing serious injury or death. Perhaps if Bloody Mary would drink a few Bloody Mary’s, she might tone it down a bit. This much less scary Bloody Mary is made by combining 1 ounce of Vodka, 3 ounces of tomato juice, 2 dashes of red hot sauce, 2 dashes of green hot sauce, 1 dash of Worcestershire sauce, ½ oz of lemon juice, 1 pinch of salt, 1 pinch of pepper and 1 stalk of celery. Should you have a particularly hard morning, substitute 1 ounce of vodka for 3 ounces of vodka… or 7, what the heck, I’m not driving!